goats cheese | Can Men Cook? A retirement lunch, for my colleague Sylvia. A lovely occasion, and really nice to be there. Why she is retiring when she looks 50 (but admits to not being), I cannot be sure. But it did give us the wonderful excuse to have 14 of us to share the celebration of her 20 years service. The Vanilla Pod is a small and discreet restaurant thriving by producing fine dining experiences, even though it has a number of Michelin starred restaurants within spitting distance. (Not that they would spit…most unbecoming). I think you can see The Hand & Flowers from the Vanilla Pod entrance. And bring on the mains! That’s where old fashioned ends. It’s all modern British fusion from then on. I’d been before, so couldn’t be tempted away from the lunch time special starter – he always has a Risotto of the Day. On this occasion it was goats cheese with compote of beetroot. Splendid. 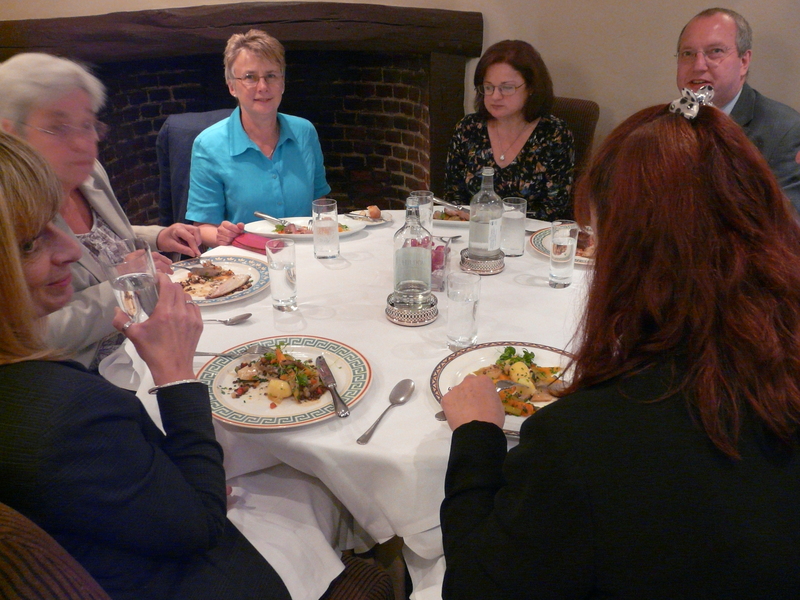 Others had a leak & potato soup – which looked really rather nice, and got rave reviews from the participants. And the third choice was a Quail Terrine Salad. If I can quote from one of the guests, Rev: “How does chef manage to keep all these elements, and all the flavour sensations so separate from each other?” Ok – I admit to food order jealousy at this point. The risottos that I have had here are simply amongst the best I have had anywhere, so the Quail people were slightly envious of us too. Hey, you can’t have everything – however much you’d like to. Out with family, you can have a soupcon of a smidgen of a taste. It just wasn’t appropriate on this occasion…but I wish I had asked! 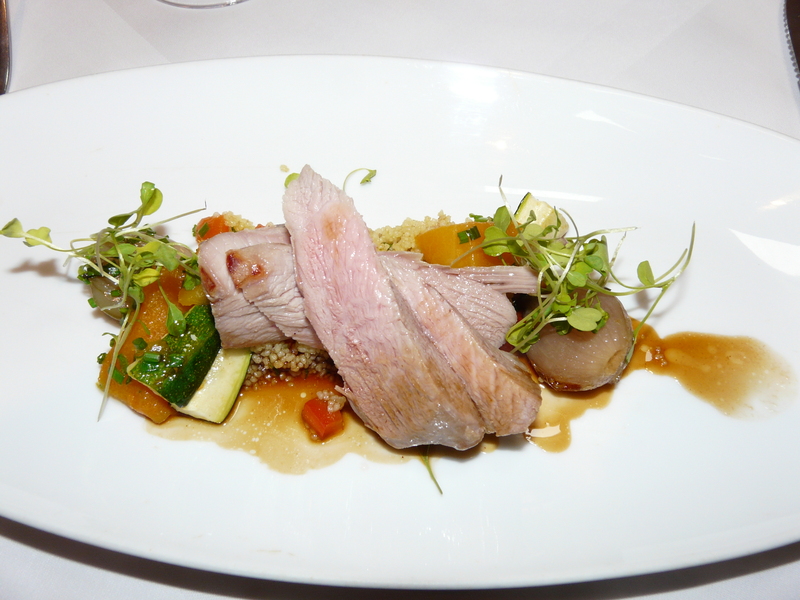 Choice of mains was Leg of Lamb, poached in olive oil, on a bed of couscous; Braised Beef Topside with white beans and port sauce; and Gilt Head Bream with something or other…sadly, just missed out on writing that down, but it did look rather fine too. And the puds? Oh yes…it had to be done. Poached Tangerines with Vanilla Panna Cotta. This was scrummy, and very adult in style – fragrant rather than sweet. And the staple of many a menu – Chocolate Mousse. The takers for this were very quiet during the eating experience. Testament enough, I feel. This is where some profit can be lost – coffee and Petit Fours was a great substitute for a pud. Some of us had both. Greedy? Gluttony? Or Gourmand? I know which I would prefer to be labelled as. Gourmet is probably going too far.